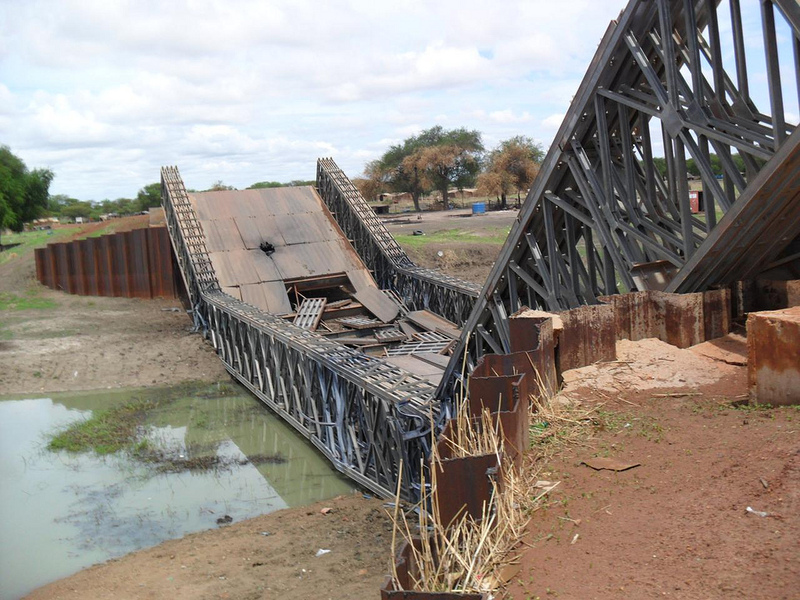 Sudan: Will Japan Rebuild Abyei’s Banton Bridge? Japan has announced that it will send a 300-member military engineering team to South Sudan as part of a U.N. humanitarian mission to build bridges and other infrastructure. A preliminary fact-finding mission may go to South Sudan as early as this year. While they have not announced which bridges they may build or repair, there is a critical need to rebuild the Banton Bridge, Abyei town’s primary link with South Sudan. The Sudan Armed Forces, or SAF, deliberately destroyed the bridge in May 2011, as revealed by the Satellite Sentinel Project’s analysis, based on DigitalGlobe imagery analyzed by Harvard Humanitarian as well as photos taken from the ground and obtained by the Enough Project. In April and May 2011, tens of thousands of Ngok Dinka were forced to flee the disputed, oil-producing region of Abyei due to indiscriminate bombardment and organized ransacking and razing led by SAF. The Satellite Sentinel Project chronicled the invasion and subsequent displacement in a series of reports. As early as March 4, 2011, DigitalGlobe imagery showed razed buildings in the Abyei region and a rapidly deteriorating human security situation confirmed by sources on the ground. In early April, DigitalGlobe satellite imagery showed a build-up of SAF heavy offensive weaponry, including helicopter gunships and T-55 tanks within attack range of the Abyei region. SSP’s predictions of an imminent attack by SAF were confirmed on May 21 when the Government of Sudan seized control of Abyei town. In just five days, the U.N. estimated that more than 25,000 civilians were displaced from Abyei town and the surrounding areas. In clear before and after pictures from May 29, DigitalGlobe imagery shows the Banton Bridge intact on May 2, and gone by May 27. SSP sources on the ground confirmed the destruction of the bridge in a series of photos. As further evidence of state-sponsored ethnic cleansing, the Sudan Armed Forces’ demolition of the primary link between Abyei town and Southern Sudan will only make it harder for tens of thousands of people who have fled indiscriminate bombardment and organized ransacking and razing in Abyei to safely return. Abyei remained occupied by a combination of U.N., SAF, and South Sudanese forces in the lead-up to the July 9 elections and afterwards. On September 8, Sudan and South Sudan agreed to withdraw all forces from Abyei; however, claims by the Government of Sudan that the situation is secured and locals are welcome to return will continue to ring hollow until the Banton Bridge is rebuilt and the South Sudanese inhabitants are able to cross the Kiir River and return safely to a rebuilt community. On July 10, the United Nations Office for Project Services, or UNOPS, published a request for proposal for the reinstatement of the river crossing at Banton Bridge; however, to date there has been no announcement that a contract has been awarded or when the bridge might be rebuilt. Japanese engineers have an opportunity to rebuild a critical link for the as many as 100,000 Ngok Dinka who were forced out of Abyei due to the Government of Sudan’s ethnic cleansing campaign.